What is rehabilitation after traumatic brain injury? Traumatic brain injury (TBI) occurs when a sudden injury causes damage to your brain. A "closed head injury" may cause brain damage if something hits your head hard but doesn’t break through your skull. A "penetrating head injury" occurs when an object breaks through your skull and enters your brain. According to the CDC, the leading cause of TBI is falls, particularly for young children and adults age 65 and older. 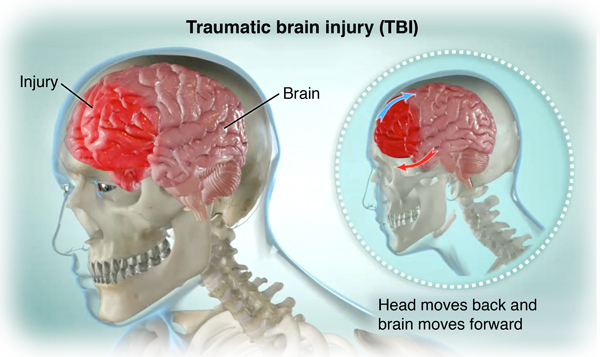 Other common causes of TBI include accidental blunt force trauma, motor vehicle accidents, and violent assaults. If you have had a TBI, rehabilitation (or rehab) will be an important part of your recovery. Rehab can take many forms depending on your needs. It might include physical, occupational, and speech therapy, as well as psychiatric care and social support. All of these are designed to help you recover from the effects of your injury as much as possible. Why might I need rehab after traumatic brain injury? What are the risks of rehab after traumatic brain injury? Rehab after a TBI is not likely to cause problems. But there is always a risk that parts of treatment such as physical or occupational therapy might lead to new injuries or make existing symptoms or injuries worse if not done properly. That’s why it is important to work closely with your rehab specialist who will take steps to help prevent problems. But they may still happen. Be sure to discuss any concerns with your healthcare provider before rehab. How do I get ready for rehab after traumatic brain injury? What happens during rehab after traumatic brain injury? Every person's needs and abilities after TBI are different. You will have a rehab program designed especially for you. Your program is likely to involve many types of healthcare providers. It’s important to have one central person you can talk to. This person is often called your case coordinator. Over time, your program will likely change as your needs and abilities change. What happens after rehab for traumatic brain injury? How long your rehab lasts and how much follow-up care you will need afterwards depends on how severe your brain damage was and how well you respond to therapy. Some people may be able to return to the same level of ability they had before TBI. Others need lifetime care. Some long-term effects of TBI can show up years later. You may be at higher risk long-term for problems such as Parkinson disease, Alzheimer disease, and other forms of dementia. Your primary care provider should be given all the records and recommendations from your therapy team to help ensure that you continue to get the right care.